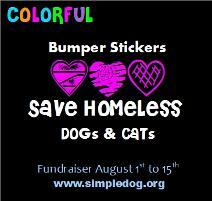 It's time for the Simple Dog Project's SUMMER BUMPER STICKER BASH FUNDRAISER! The Simple Dog Project is featuring their fun and colorful made in USA bumper sticker and magnet bones on their website from August 1st to 15th, 2103. During this special fundraiser challenge, for every bumper sticker and magnet sold, the Simple Dog Project is donating a complete $5.00 to Texas Adopt a Greyhound Society, Inc. when you choose us at checkout. To support us during this fun event, simply select 'Texas Adopt a Greyhound Society (TAGS)' from the drop-down menu when you put any bumper sticker or magnet in your shopping cart. While you're there, watch the 2 minute short YouTube video entitled "Petunia Was Rescued" because every bumper sticker sold give rescued hounds a second chance. Helping pets one bumper sticker at a time August 1st to 15th, 2013. Please support our Greyhounds today, this bumper sticker fundraiser runs the first two weeks of August only! Go to Simple Dog Project to place your order now. Thank you for your donation.